is the latest in what seems like a very, very long line of cookbooks aimed at helping people feel more confident in the kitchen, and cook better food more easily asa consequence. There’s nothing wrong with that, and many of these books have some excellent ideas that cover several important bases: quick, nutritious, easy, cost effective. This book isn’t an exception, and it has a few twists to it, too. when people started grumbling that some of the recipes took far longer than half an hour to concoct. Oliver was on the right tracks, though, and Mackay’s book feels like it picks up the thread, deftly side-stepping Jamie’s time-bound albatross. 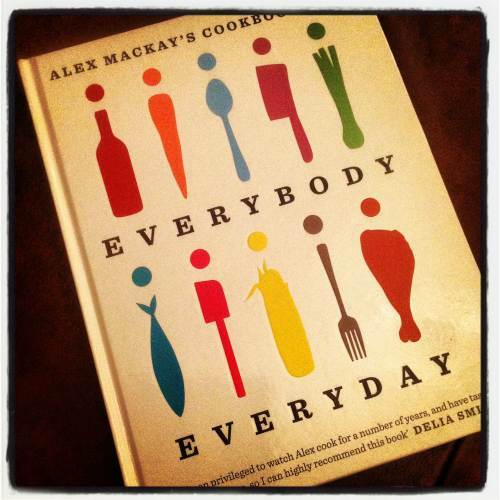 Mackay’s take on everyday cooking centres around the idea of “heroic ingredients”, a handful of solid base ingredients that can be dressed up any which way you want. He takes six ingredients – baked chicken breasts, baked salmon fillets, roast aubergines, pork chops, pasta/risotto and burgers – and presents six different ways of preparing each, in such a way that each recipe sets a different tone and provides a different twist. The basics stay the same, but the dishes transform. This has the effect of getting the possibly nervous cook used to the way that particular ingredient cooks, and opens their eyes to the possibilities it brings. The next big section takes a similar theme, this time focussed on “the magic fridge” – six sauces that can be made in bulk and stashed in the fridge until those (probably frequent) days when you get home and just can’t be arsed bothered cooking anything but want to eat something that tastes good. It’s a fairly safe list – pesto, tomato compote, garlic butter, green curry paste – but there are a couple of curve balls in there – black olive tapenade and caramelised onions – just enough to provide a few extra nudges and introduce some tastes and ingredients that aren’t often used in that ‘standby sauce’ way. Again, six ways with each. The last section focuses on slow cooking, with six big proteins – chicken, lamb shoulder, belly pork, mackerel and braised lentils – and six ways to deal with the leftovers. You get the idea – six times six. It’s logical and versatile. The book is topped by quite a section on seasoning food, which isn’t a bad idea, because it’s hard to get right and extends beyond just salt and pepper. Seasoning makes or breaks a meal, so a few pages on getting it right are worthwhile. Less so the section on equipment, which includes a definition of a dishwasher. is well worth a look. It’s full of great ideas and has a real sense of direction and purpose about it. The focus on core ingredients and the way that they can be used and re-invented helps to build a strong repertoire of good, solid dishes that anybody can cook, everyday.